Hi all, today we are waiting for a second storm to pass. The Celtic Explorer is sitting in Ventry giving us some nice down time to reflect on what happened after the flurry of wind and waves we had at Rockall last week. After the stormy days at the start of our trip we had retreated south across the Rockall Trough down to the north-western edge of the Porcupine Bank. From here the next leg of our journey brought us along the western flank of the Porcupine Bank. We stopped at particular areas along this bank that were of special interest to us. Our first stop on the Porcupine Bank was a coral mound that had previously been noted to have suffered from deep sea trawling; the twin mounds. Anthony Grehan ran an ROV transect over 10 years ago at this location and had observed the damage resulting from bottom trawling. The aim of our visit was to run the ROV along the exact same route that was ran 10 years ago to assess the current condition of the site. Fiona Carey, an undergrad student in NUIG will be analysing the two ROV videos of this site (past and present) to assess any recovery of this Lophelia reef over time. The images that we saw included small low coral reefs and flattened areas that on first glance do not seem to have a high degree of recovery. 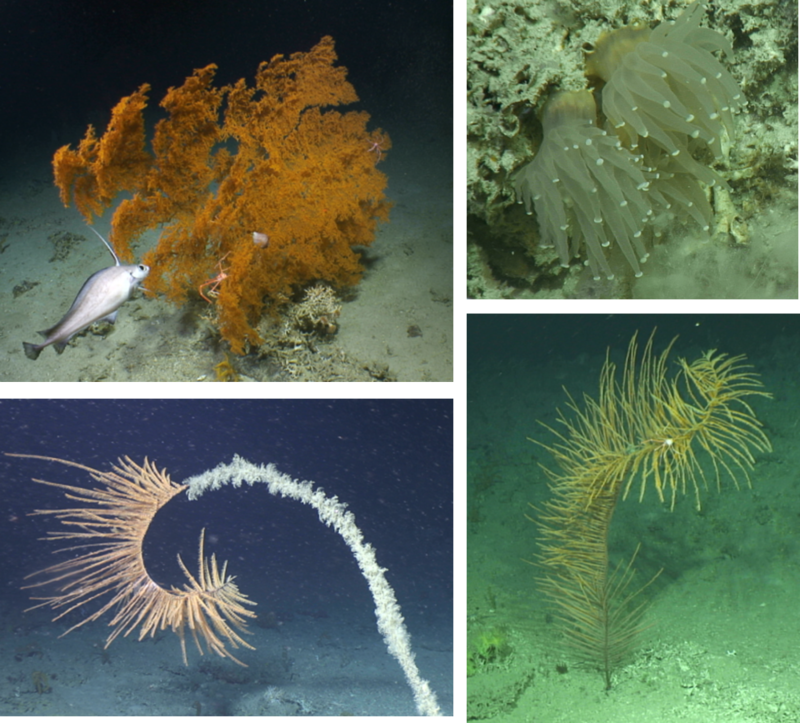 We have also visited the South West Porcupine Bank SAC (Special Area of Conservation) where Plymouth University’s modelled map predicted cold water coral reef would be found. At this site there were indeed rich, colourful, diverse coral reefs present. It was a picture perfect site with beautiful specimens of reef forming corals, associated sponges, crustaceans and fish as well as black corals, some spanning up to 2m height. As the ROV meandered through this habitat we observed the densest, richest coral reef areas on the up current sides of large scale topographic carbonate mounds. 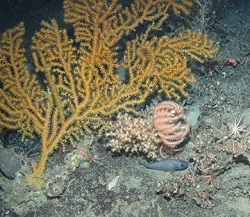 The down current side of the mounds, on the other hand, presented biotopes with more sediment based substrate and more black corals and stalked sponges. In these sediment based biotopes off the main coral reef was the space needed for great specimens of black coral to grow and flourish as seen below. Since then we have been trying to find sponge sites on the continental shelf edge to validate Plymouth University’s sponge distribution model. We were blessed with good weather for some of this time and found some brilliant sites, but we will update on them next time. We are also working on making observations of oceanographic phenomenon such as internal waves and interacting water masses around the Porcupine Seabight. More updates soon.